I haven't had time to blog for weeks....but I have been sewing! This is one of the many shirts that I've been making for my clients. The fabric is a luscious wool gauze...light and airy...and slightly crumpled in a good way. This design features a bias cut button band and bias cut sleeves with bias sleeves plackets (the plackets made with coordinating wool gauze stripe). I also added a double-pocket. Working with wool gauze is not difficult, but is usually better suited to designs with more drape than a structured menswear shirt. The key to making this beautiful fabric "work" for the structured parts (collar, cuffs, front band, and sleeve plackets) was using the right interfacing. My newest Interfacing style, *ProSheer Elegance MEDIUM Fusible Interfacing* provided the perfect amount of structure plus flexibility needed for a nice crisp collar and cuffs...without "weighing down" the design. SEWING NOTES-- Interfacing and buttons available at www.FashionSewingSupply.com , Wool Gauze fabric from my personal "shirt-making fabric stash". A few words about the new men's shirt pattern from Vogue. It will be a while before time allows me to make that particular shirt. I still need to finish more custom-drafted shirts for clients before I can indulge in any personal sewing...and the first personal sewing I'll be doing before I evaluate yet another shirt pattern, will be making a few outfits for my Grand-Nieces. In the meantime, Peter from Male Pattern Boldness has made V8889, and has reviewed it both on PatternReview.com and on his blog. He did not choose to use the interesting undercollar-button detail, so perhaps I'll find the time to a least make the collar+stand to show you what that little detail is all about! Amazing job once again, Pam. You are one talented lady. Is wool gauze transparent like gauze? Hi golden_star... wool gauze is made in different weights, but all are at least "semi-transparent". 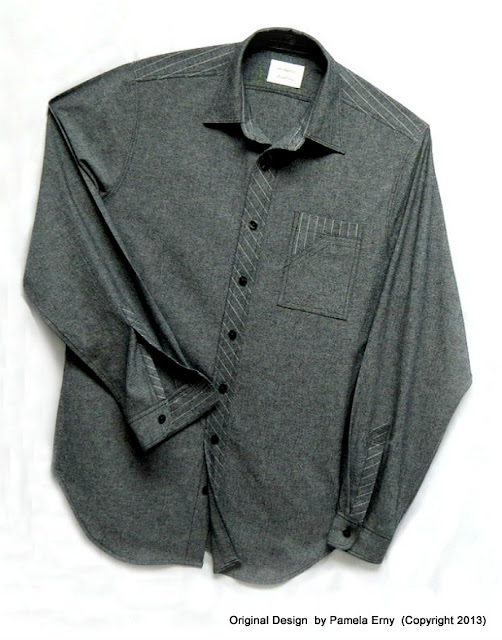 You can see the how sheer the fabric I used for this shirt is by looking at the lower-front. The back of the shirt can be seen "shadowing" through the front. Hi Kay, thanks, glad you like it! That is a beautiful shirt Pam. I love the detailing. I've got some grey wool gauze in the stash as we speak. I am duly inspired, Pam, once again! Thanks Bunny...I know your wool gauze shirt will be fabulous (as always)! What a beautiful shirt - just gorgeous. Was the striped bias trim a wool gauze also? I love this shirt! Wool gauze - I've never heard of it before, is it as soft and luscious feeling as it sounds? Hey Pam, could you please tell me which fusible tricot interfacing would be best for block fusing boucle fabric??? And does it come 60" wide??? ...among other uses, it is PERFECT for stabilizing boucle, while keeping the fabric's hand and drape.